High energy ... 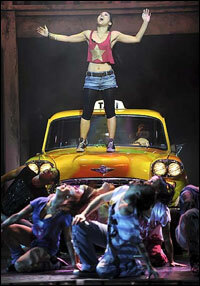 Fame The Musical. YOU want fame? Well, fame costs. And the cast of Fame, the high-energy musical that opened at the Regent Theatre last night, aren't just paying in sweat. Think exhaustion, pain, and the risk, every night, that one heavy landing might cost them their careers. That's why physiotherapist Sam Peasnell from Absolute Physiotherapy has been working with the cast for the past four weeks. He's not only tending to knees, wrists, necks and backs, but consulting director-choreographer Kelley Abbey, and working with dancers to discover the safest way to fly high without crash landing. ''Fame's dance moves are really quite ballistic,'' says Peasnell, ''and they're dancing from whoa to go with very little rest. Sobriety is the price of fame for 22-year-old lead Timomatic (full name Tim Omaji), who plays the role of truculent streetwise dancer Tyrone Jackson, the musical's equivalent of the film version's beloved Leroy. Discovered when his hip-hop moves got him into the finals of last year's So You Think You Can Dance, Timomatic was never one to worry about fitness before he was cast in this show. But performing eight times a week has taught him rigour and endurance.